5 Ways To Boost Your Immunity - Avoid Getting Sick! thanks for these tips! I’m battling allergies ATM so this is helpful! I do need to work on the sleeping part but exercise is my sanity-saver so maybe that’ll make up for my early mornings of rolling out of bed! Visiting from Talk of the Town party. Sleep I think is the best way~ Tough sometimes to get enough. Thanks for linking up to Merry Monday! Pinned! Have a great week! My daughter just started teaching 6th grade this year. I’m passing on this info to her, I know it will help- thanks! I am really working on the sleep part. I know how important it is to get good sleep but I have so much trouble sleeping. Thank you so very much for the tips, it is getting to that horrible time of the year when the bugs start descending. I am already starting to feel under the weather so will following these now!! Great tips for boosting immunity and staying healthy. I like that they’re lozengers and not tablets – makes it easy to take them on the go. Do we really need the supplements? I’m 30 and I’ve never taken any, I need to start doing my research on which ones to take. Sleep is definitely a big factor. I was reading an interesting article the other day about how over-exercising actually leads to lower immunity, despite the other benefits of exercise. There is no way to eliminate stress in the marriage I’m in. However, I see the importance of the other ways to boost my immunity. I’d love to feel better and be sick less often. This is a very nice reminder! I find it difficult to get motivated to stay active during autumn/winter and you just made me want do something about it! I agree with all these, I find being active has been a great boost for my immune system. My immune system is better than it was before but I would like to improve it. Ricola Herbal Immunity sounds great. These are great tips! Avoiding stress is a hard one but it’s necessary. Thanks for sharing! Oh my lands, some of these are so hard to do! I know they’re perfect tips though! Avoiding stress is a hard one for me but I know it’s necessary. Such great tips! These are great tips as we get into flu season. We only use Ricola cough drops, I love that I can buy them at Costco! Someone gave me a Ricola to try not too long ago and it did a great job. It had a pleasant flavor too. Now that school is back in session, I am super paranoid over the germs coming home. I need this in my life. Wonderful tips! I always seem to be sick in our family, so this would be perfect for me. I’ve always enjoyed ricola so I will have to see about this! Great tips shared! For increasing Vitamin C in my diet, I eat Oranges and occasionally takes multi-vitamin! I am missing sleep days due to work. I need to get some more sleep! It is really important that we take care of ourselves and boost our immunity. This sounds like a great product. Oh, this is nice. I haven’t tried anything like this. Looks like I need this! This sounds great. I definitely need to try them out. I don’t think I’ve done a good job with any of those this week. Time to cut back on stress and take a nap. These are indeed some really useful tips for everyone! I’ll keep these in mind. Thanks! I really think getting enough sleep for me plays a massive part in boosting immunity. I’m a big fan of vitamins too. I’m trying my best to get those 8 hours of sleep and whenever I manage it, I feel great the next day. We have used Ricola in our house for some time now but haven’t tried Ricola Herbal Immunity yet. 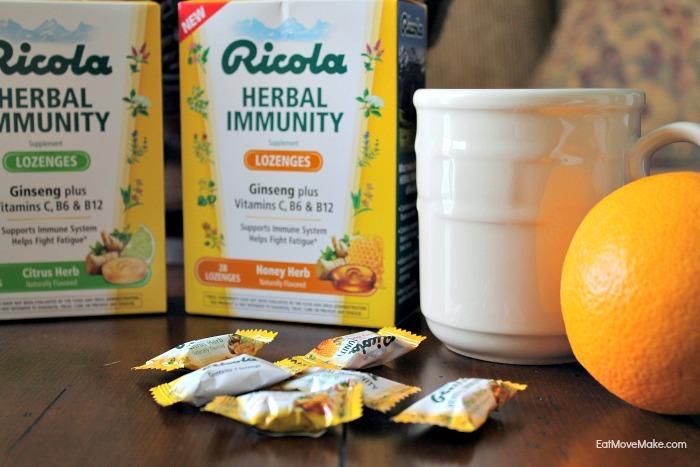 We haven’t tried Ricola Herbal Immunity too, but if it does help keep those sniffles at bay, I’m all for it. Adding this to my grocery list. These are really great tips that I need to be more aware of. I do not get enough sleep and my stress level is way too high. Sleep is so important and I do not think we realize how much we need it! I love Ricola and I would definitely add this to my fall regimen of taking better care of myself. Yes! I love carrying these around in my purse on the off chance I’m having a coughing fit! I have a green smoothie every morning and it has honestly made such a difference! I feel so much better for it. Eating healthy food and taking vitamins regularly are essential for me to maintain to a strong immune system! I am a huge fan of Ricola! These are all useful tips! Having enough sleep and healthful diet are very important! Would love to try this Ricola for me and my husband. I’m all about boosting my immunity at the moment with all the germs flying around. Great tips! I definitely notice when ever I don’t get enough sleep that it really effects my health! People are usually really low on/in Vitamin D in their bodies. Most people don’t even know this as this is not known unless you have a blood test. BUT, if you are feeling poorly, up (like really UP) your vitamin D (high dosage vits) for like 3 days, and you will feel SO much better! I am so happy I have only really been sick once this year (knock on wood). I try to stay healthy to build up my immunity to all those germs. I cant’ agree with this post more! I have been making myself sleep more and also meditating each day to help alleviate the daily stress! i needed this! the sleeping more and avoiding stress part is hard though! will have to boost with some vitamins. I never get enough sleep which I know is bad but I can say the Honey lozenges are great! I used them last winter when I got sick! You have two tips here that I need to work on: getting enough sleep and avoiding stress. I just can’t seem to get stuff off my mind and it bothers me. I really need to work on that. Me too, Dawn. I need to work on these two things – sleep and avoiding stress. Although sometimes, stress really finds a way to get to me! Last Fall we were sick all the time. I need to implement these tips so we are healthier this year. There’s nothing that will keep you from health issues like enough sleep and a healthy lifestyle. It’s important to make sure your body has enough time to re-energize. Aside from that, daily vitamins will help a lot as well. These are awesome tips! Those are great tips. I’m considered according to my mom, “High Risk” because I have allergies and asthma year round. I’m also a teacher, and around my kids. I need all the help I can get. The Herbal Immunity sounds great! I think I’ve had that brand’s cough drops, but I haven’t tried anything else from them. I really need to star taking vitamins – they are so important to the health of your body! Thanks for the great tips! I definitely notice that I tend to get sick when I’m run down or overly stressed. I try to combat that with exercise, vitamins and a good diet. Really hoping this season it makes a difference. This is a great reminder because I feel like, as a mom, I always forget to think about myself. I need to make it a point to take care of myself in simple ways like sleeping more and taking that walk after dinner with the kids. I haven’t taken vitamins in quotes while though I know I should. I barely sleep. Need to diet and exercise. All important. Thanks for the reminder. So many people dying around me from sicknesses. Time to take my own health seriously for real. I wish people would just cover their mouths and noses when they sneeze or cough. It is doing everyone a favor is they would! Boosting our immunity would be the best way to keep those harmful germs and viruses at bay. I’ve got to get Ricola lozenges too! I have to try this product. My immune system always seems to be weak this time of year. I try my best to take care of myself but the back to school time is one of going and stress. This is definitely the time of the year to boost your immunity. i will have to pick up some Ricola Herbal Immunity drops to try. Stress can definitely take a toll on your body and it’s immune system. I try to keep my stress level down and get enough sleep. Oh, I have never tried these before! I always keep a bag of Riccola in the house for coughs and such! These must be good. These are all really great tips! With school back in session is can be hard to get a good nights sleep. Great tips! With the kids back in school, it is so hard to not get sick. I take my vitamins and drink water and eat healthy. Thanks for the chance! These are all great tips for keeping those germs away! I know my body functions best when I am eating right and exercising regularly. YES YES YES! Sleep is so important! When I lack in sleep I always get sick. Exercise is a great tip too! Such a great post! These are all great ways to boost your immunity. Glad that you shared these! Lots of good tips there I need to boost mine as I am coming down with a cold. Those lozenges would be great for me. If there was ever a time I needed these, now is the time. My throat is starting to ache, and my body just wants to relax! I saw this at the store. I want to try it for sure. This is not my favorite season. Retail holiday season takes a lot of your, so this a great way to help from getting sick. Great tips I always catch a cold this time of year so need to start boosting my immune system. I like the regular Ricola drops. I will have to give these a try because usually around January I get bronchitis from my allergies. The honey herb sounds yummy! Such a wonderful post, especially going into that “Special” time of year. Ricola is my go-to living over here in Europe, and I love working up a sweat to beat the sickness, as well as staying hydrated, and getting proper rest (listening to my body) I feel like that’s easier to do in an area where busyness is not the norm. These are definite great ways to boost your Immunity! I for one definitely need to start getting more sleep. Not getting enough sleep is really bad for you and it’s a habit I need to stop. Such an important post to write about! Especially as winter is approaching – Ill be sure to try out your tips! Ricola has always been a favorite of mine. We also love local raw honey for avoid sickness. As I stated this is an overlooked item that could well improve the quality of life. Thanks for the great and quality article. I think I come down with every cold that comes around. I am trying to get more sleep and avoid stressful things though! It might have been me you saw running for safety lol! I do always get sick when the weather turns cooler and yes, I always have Ricola in my purse! I love it. These are great tips!! I know with kids back in school flu season is right around the corner for us. These are all really great tips. I think that many folks don’t really think of getting enough sleep as being so important. When they are laying in bed sick, they may think different. I love Riccola products – I didn’t know they had an immunity lozenge. I will be on the lookout for it. I stay in for the most part during the colder months of the year but it seems that every time I do venture out I get sick. I’m not sure if it’s because I stay in my environment too long and when I am around others it just upsets my immune system or what. I use Ricola regularly but didn’t realize that they had Herbal Immunity Lozenges. I will definitely be picking up some of these before winter arrives because I’m sure every little bit helps. Thank you for the heads up. These are all great tips. I know that I could stand to increase my immunity. I am always sick this time of year. I need to work on getting more sleep and being more active. With cold and flu season here I need the extra boost to my immunity. I will have to see if we have these here in Canada. Going to definitely check out these Ricola. Every little bit can help when it comes to being safe from germs. Tis almost that time of year where we really have to be careful. Thank you for the reminders. As a mom, meeting some of those tips can be hard but its a good goal to have, regardless. My wife is a nurse, so I’m always worried about her bringing home a virus thta will wipe out the whole family, so these are the things I really need to know. You know, right now. I’ve been visiting a sick relative in hospital for weeks now so I use my essential oils to give me a boost! Boosting one’s immunity is so important during this time of year, when germs seem to be everywhere. I love Ricola drops as they are delicious and effective at improving one’s immunity. Thanks for sharing these tips. I’m all for those boosts. I used to take zinc tablets but the company stopped making them. I’m totally looking for some new supplements to take for the winter. I need to look for these! We use the cough drops but this would be great for prevention. I try to drink a lot of immune boosting tea during this season as well. This is the perfect time of year for these reminders. I’m actually home sick today with some sort of virus. I hate being sick! Great tips, especially this time of year. My daughter just had strep so I am hoping to avoid the sickness myself! Thanks for the tips! We only use Riccola in our house because they are very effective and taste great too! These are great tips. When cold and flu season rolls around, I lock this place down like Fort Knox. No one here has time to be sick! I always reach for Ricola when I have a sore or scratchy throat. I’ll have to be sure and grab the new herbal immunity. First of aLL I LIVE for ricola and second of all yes to all these tips and especially sleep! I think we forget how much we need to rest our bodies–great tips! Sleep is something I need more of. I spend way too many late nights typing and working. You have great advice here. Good tips overall, though sometimes it is beyond our control – like avoiding stress or getting good sleep. I love Ricola too, always carry a box in my handbag. I always here nothing but positive things about Riccola- I think that I may have to give their immunity lozenges a try! I love Richland drops. I did not know they made an herbal immunity tea as well. I plan to use it this cold season to boost my immune system. As one who has been fighting a weakened immune system for years, I can honestly say that these are all really great tips! I need to get me some of those Ricola Lozenges stocked up before winter hits. 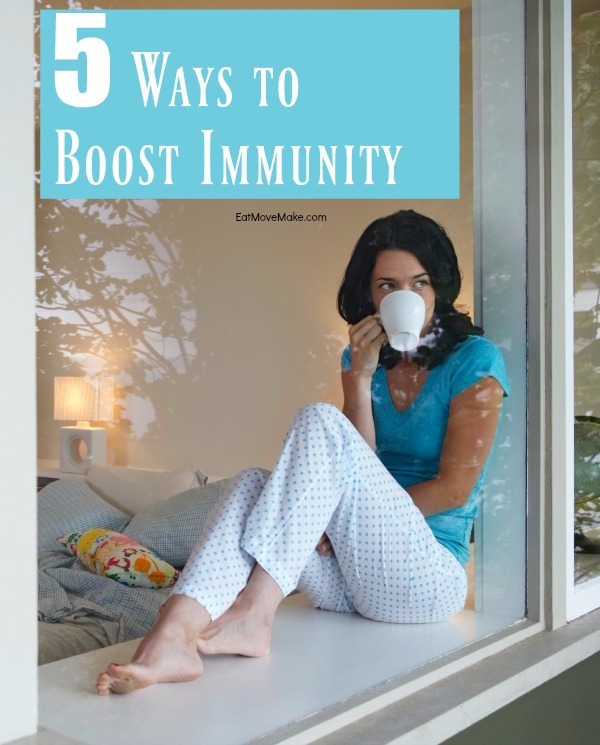 I like the tips and pointers on boosting immunity. There is no better asset than having a healthy day. That is something money cannot buy. These are such great tips! I am pretty good at being healthy, in general… I just don’t get nearly enough sleep! I have been using all of your tips for quite some time but I never knew of your immune boosters until now…thank you for furthering our good health. These are great tips to boost your immunity. My immunity is low. Everytime the temperature drops I get a cold. I like the tips and admit that I am guilty of some of the things. I love Ricola lozenges and had no idea that they had lozenges to help boost immunity. I am going to look for them this weekend. 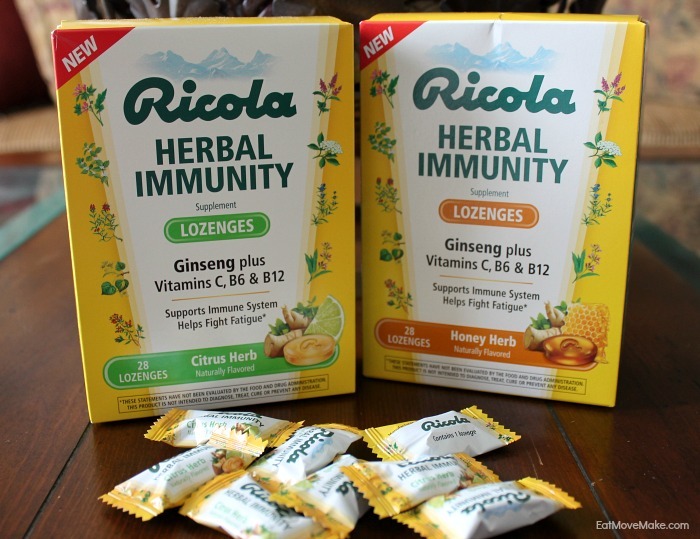 Ricola Herbal Immunity sounds like a great product for me. I will have to pick some up to help me fight off all the colds going around. I would love to boost my immunity. It is cold and flu season and I always end up getting sick. All great tips! #1-4 are so hard, but so beneficial. So I’m grateful for tip #5, because that I can handle. Heading to the store for Ricola ASAP. This looks like a great product – I do recognize the brand name. These are great tips! I have already been sick twice this season so I need to do some of these! The next time I go to Walgreens I will look for the Ricola Herbal Immunity Lozenges to boost my immunity and to fight fatigue. Thanks for the tips! I’ve always liked Ricola for their sore throat lozenges so I will have to give these a try. I know I don’t get enough sleep. I will have to work on that. I learned that you should still Be active. I did not know that. Thanks for the info. I am trying to get healthier and sleep is the one I have the hardest time with. I have insomnia so sleeping doesn’t always come, but I am trying every other way LOL. I’ve tried immune boosters before, but I had no idea that Ricola made their own immune booster. I like that they offer two different flavors too – honey isn’t my favorite, but I think I might like the citrus. I’m going to have to look for these the next time I’m at the store stocking up on cough drops. This sounds awesome! I just got over one of the worst colds I have ever had that hung on for a week..I will have to try this. I bought this last week and just started using it, I use their other products so I think this will work very well.